Coastal Bend College and Alice High School present Mariachi Showcase, an extravanga of mariachis of all levels. 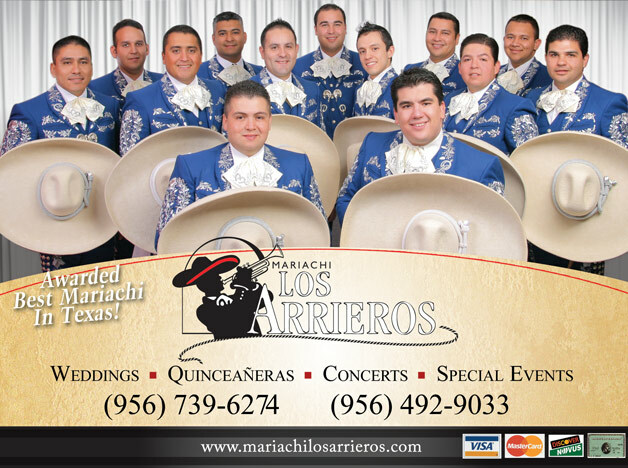 Mariachi Los Arrieros del Valle of McAllen will headline the April 17 concert. Mariachi UTPA will also perform. Dia Del Mariach i Overall Vocal and Group winners will open the show, following the all-day Dia Del Mariachi competition. Mariachi Los Arrieros del Valle was formed in the spring of 1996 and is quickly becoming one of the most popular mariachi groups across the country. Los Arrieros is a 12-piece ensemble, under the direction of Alex Trevino and Marcos A. Zárate, comprised of young and talented musicians with a desire to promote the beauty and splendor of mariachi music. With their energetic shows, strong vocals, stirring melodies and masterful execution of classical, traditional and contemporary arrangements, Los Arrieros have captivated audiences across the United States and México. Los Arrieros has performed at such prestigious venues as Walt Disney Concert Hall in Los Angeles, Calif., where they were the first mariachi ensemble to perform on its stage. They have been featured performers at the Mariachi USA Festival in Hollywood and the world-renowned Hollywood Bowl for the last seven years, where they have continuously brought the sellout crowds of 20,000 to their feet. They have performed at the AVA Amphitheatre in Tucson; the Bellagio Hotel and Casino in Las Vegas; and the Verizon Amphitheatre in San Antonio. They appeared on VH1’s feature My Big, Fat, Fabulous Wedding in the summer of 2007. Key performances in the area include the Southwest Independent School District Mariachi Conference in San Antonio; and concerts at the City Auditorium in Uvalde and the Houston Livestock Show & Rodeo at both the Astrodome and the Reliant Stadium. They’ve performed in McAllen, Victoria, Bryan and Harlingen, for various festivals. In México, Los Arrieros performed in Atotonilco, Jalisco. They’ve shared the stage with world-class artists such as Mariachi Vargas de Tecalitlán, Mariachi Cobre, Mariachi Sol de México, Mariachi América, Mariachi Imperial, Mariachi Los Camperos, Mariachi Reina de Los Angeles, José Feliciano, Trío Los Panchos, the Las Cruces Symphony Orchestra, Vikki Carr, Pedro Fernández, Rocío Dúrcal, José Guadalupe Esparza of Bronco, Joan Sebastián, Joe López, Bobby Pulido, Roberto Pulido, Humberto Herrera, Ramón Ayala, Dulce María Castro, the tenor Mauro Calderón, and Rodrigo Vidal. Most of the members of Los Arrieros are educators at various school districts in the Rio Grande Valley. They are experts in music education, kinesiology, engineering, literature, biology and university-level education. With a strong base in education and an unwavering commitment to their music, Mariachi Los Arrieros del Valle represents the music of Mexico to its fullest with its vigorous sones, doleful huapangos, dynamic rancheras, and romantic boleros. For more information about the April 17 concert or to purchase tickets, contact J.J. Sanchez, Coastal Bend College, at (361) 664-2981 Ext. 3042.